The entire history of a wealth-maker in three megatrends. 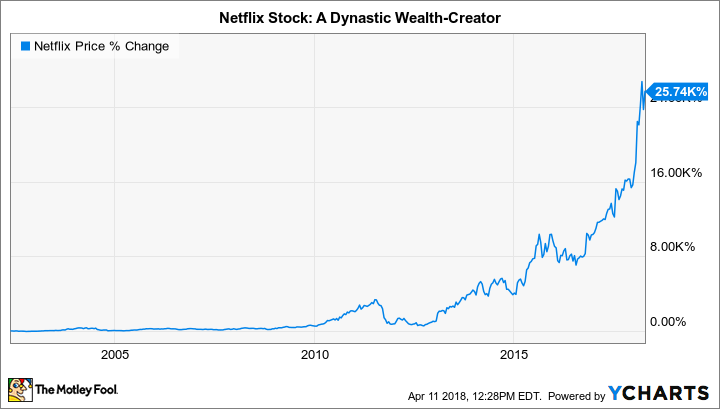 Long-term shareholders of Netflix (NASDAQ:NFLX) have accomplished every investor's dream: They have caught lightning in a bottle. What started out as a venture motivated by CEO-founder Reed Hastings' frustration with late fees at Blockbuster has morphed into one of the most important media companies of the 21st century. While it may be an oversimplification, it's useful to think of Netflix's rise to power as a result of the combination of three very simple ideas: a switch to streaming, international expansion, and original content. We anticipate that the DVD will, for all practical purposes, replace the VHS cassette and thereafter, the DVD will enjoy a similarly long consumer lifetime. While the latter part of the prediction turned out to be wrong, it didn't really matter. That's because Netflix was one of the first to identify, and act on, the importance of streaming. Data source: Neflix SEC filings. Chart by author. At the beginning, streaming was limited to just a few titles, and most people stuck with the DVD-by-mail service. Then came the infamous Qwikster debacle. To Hastings' credit, he quickly realized the mistake he made, moved on, and focused almost all of his effort for the next two years into building the most convenient, easy-to-use streaming site in the world. All of a sudden, instead of needing to hold massive inventory of DVDs, running up huge overhead costs, Netflix was able to deliver movies to anyone with an internet connection. That completely revolutionized the business, and the number of subscribers grew by leaps and bounds. Data source: Netflix SEC filings. Domestic streaming included all subscribers until 2011. Chart by author. Currently, there are almost 55 million domestic Netflix streaming accounts. Considering that there are 126 million households in the United States and that multiple user profiles can exist under the same account, it's hardly a stretch to believe that over half of all American households watch Netflix. Data source: Netflix SEC filings. Chart by author. You might notice that initial blip way back in 2002. That's when the company had intentions of expanding into Canada and the U.K. But then, Walmart announced that it would be starting its own DVD-by-mail business, and Hastings decided to ditch the expansion and focus on the competition stateside. That's impressive. Equally impressive is the fact that the company started telegraphing an international move in earnest in 2010, and it was able to gain over 50 million subscribers worldwide in less than a decade. But as important as streaming and international expansion have been, neither creates a lasting moat around Netflix. While the company may have been the first-mover in each category, the competition has reached the point where it, too, has international streaming capability. The monthly payments are auto-billed, and are so low that we don't even really notice them when they pop up on our credit card statement. ... The bottom line is what makes Netflix appealing for non-users is increasingly becoming original content. And at these prices, it doesn't need to offer 10 blockbusters that appeal to each potential new subscriber to get them to sign on. It just needs one. When it comes to original content, that didn't start popping up in the annual reports until as recently as 2013. The company dabbled in original programming with its Red Envelope subsidiary in 2007, but that went nowhere. It wasn't until 2013 -- with the release of uber-popular House of Cards -- that Netflix's original programming really took center stage. When you consider the economics for end users, it's impossible to ignore what a great deal Netflix offers. You can pay over $50 for a binge-worthy TV series elsewhere, or just fork over $10 per month for Netflix and get access to a host of binge-worthy shows and movies. That helps explain why the company's efforts in original programming have absolutely exploded recently. Data source: Wikipedia. Chart by author. And if you think that growth is impressive, the company is planning for much more moving forward. It plans to fund as many as 700 new TV shows and movies this year alone! That will only help widen the moat, as subscribers who are already on auto-pay will have even less reason to cancel, while non-subscribers will have an incentive to sign up, and should come in droves. That's right, an investment of just $10,000 back when the company went public in 2002 is now worth over $2.5 million. Investors can thank streaming, international expansion, and original content for that appreciation. In the years ahead, original content will become more and more important for Netflix. While the company is spending hand-over-fist for it now, I believe it will ultimately be in the company's -- and shareholders' -- best interest to grab subscribers now. That's why my skin is in the game -- I own the stock -- and if you have a long enough time frame, I think you should consider doing the same.